Some people look forward to Back to School season, but for other people, the return of yellow buses, packed classrooms and homework means nothing but tears. I know! Fine horse jewelry fixes lots of existential problems, including the dread that comes with standing in front of a class of middle schoolers, trying to convince them that yes, someday they will be very glad they know algebra. Treat yourself now. The most important school supply is one that makes you feel good about yourself. When you look good, you feel great – and if there’s anything you need to survive teaching, it’s confidence. 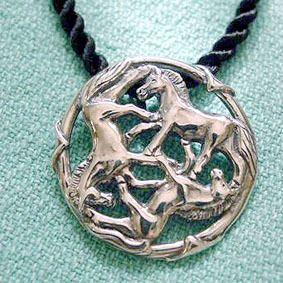 The Sterling Silver Celtic Horse Pendant Three gorgeously rendered horses pace a never-ending circle, continually making progress – just like your most reluctant students! The details make this piece – check out the great manes and tails. Very wearable and perfect for everyday. 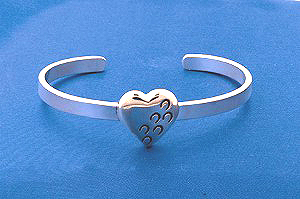 Our best selling “Hoofprints on Your Heart” bracelet is a great choice for back to school style. It’s made in the USA of sterling silver, is extremely wearable and affordably priced, and, if push comes to shove, serves as an instant lesson in symbolism. After all, what could all those little hoofprints running across the classic heart shape possibly mean? 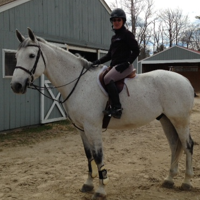 Designed for the horse lover by horse lovers, the Hoofprints on Your Heart line makes a great gift for the teacher in your life – even if YOU are the teacher in your life!